Nobody I know has ever enjoyed looking for work or putting together a CV. That includes me. So why would I opt to write about a CV tool? That’s exactly why. Jobseekers need all the help they can get. A tool that helps simplify all of the formatting nightmares that inevitably arise… That’s gotta be worth a lot of good karma. 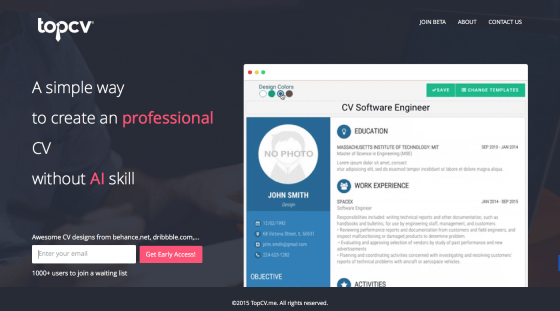 TopCV is the “simplest way to have impressive Curriculum Vitae (CV) without Photoshop, AI skills.” Designers have already done the hard part, making attractive CVs readily available and easy to assemble. So, jobseekers spend less time on the CV and more time on finding work. I’ve seen quite a few CV tools over the last couple of years. Understandably, because no one really likes them, loads of innovators have attempted to recreate them – replacing it videos and all variety of graphic representation. What I appreciate about TopCV is that it still looks like a CV. For all the complaints, a conventional CV is still the undisputed champion of the job search. Everyone looking for work needs a CV that’s easy to recognize, yet still appropriately eye catching. Basically, everyone from recruiters to jobseekers and everyone in between deserves mercy when it comes to the CV. TopCV is up to the task, going easy on the eyes, while allowing for the creation of informative CVs that give applicants the shot they deserve at landing work, regardless of their CV-building chops. Hooray! Jump on the beta fan train at topcv.me.